The main lyrics talk about someone having a photograph of their big crush which they just can’t stop staring at because they are so besotted by them. So taken is the singer with their love interest that they would even like a Doctor to take a picture so they can look at then from the inside as well (as my particular favourite lyrics from the song state!). Quite what this has to do with turning Japanese though I’m really not sure. All in all a great fun song that whenever I hear it always takes me straight back to my youth. I also particularly like it for the weird sound effect that always reminds me of the ace puppet series Star Fleet. Listen out for it at the end of the song, which you can watch and listen to below. It’s when the traditionally dressed Japanese woman is playing the tubular bells. This entry is filed under Music - Songs	and was posted on July 8th, 2011. You can follow any responses to this entry through the RSS 2.0 feed. You can leave a response, or trackback from your own site. 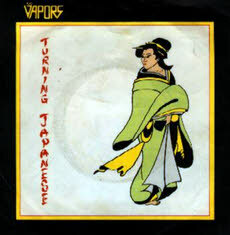 Here’s one theory I heard…the song Turning Japanese is about lusting after an asian woman, ogling her picture (and even wanting to “see her from the inside as well” and masturbating. The inference being that when a man ejaculates he has squinty eyes, al la Japanese. Just what I heard….